Seth MacFarlane's Cavalcade of Cartoon Comedy is a cartoon web series created by Seth MacFarlane. This series is a compilation of animated sketches released on YouTube. The series, which aired several episodes a month, was originally sponsored by Burger King, with videos appearing on their official channel. The series was then sponsored by Priceline.com, and finally, Nike. There are a total of 50 episodes. It has seen a successful launch on MacFarlane's YouTube channel, SethComedy, becoming the most watched YouTube channel of the week, generating three million video views within two days of the first episode was released. The first season, with additional content, was released on DVD and Blu-ray Disc on May 12, 2009 and was released on DVD in the UK on January 25, 2010. In addition to the 23 episodes officially released online, 27 episodes were exclusively included on the DVD and Blu-ray release. The release uncensored the first eleven episodes which were censored online. ^ Jacqui Cheng (2008-09-10). "Family Guy creator opens Cavalcade of Comedy for business". arstechnica. ^ Dave Parrack (2008-09-12). "Seth MacFarlane scores a hit with Cavalcade of Comedy". WebTVWire. 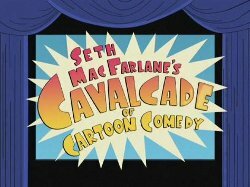 ^ "Seth MacFarlane's Cavalcade Of Cartoon Comedy (DVD) (2009)". Amazon.com.